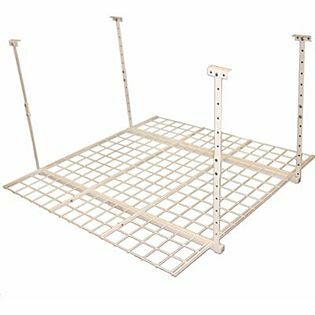 This is the summary of consumer reviews for Evriholder Magic Holder 5-Position Wall Organizer. The BoolPool rating for this product is Excellent, with 4.50 stars, and the price range is $11.13-$23.29. 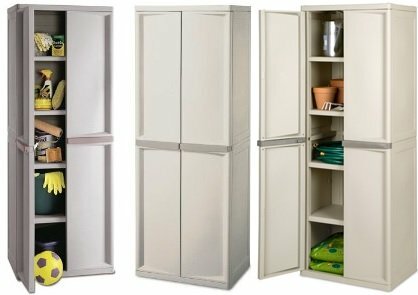 The Evriholder Magic Holder 5-Position Wall Organizer is an organizing gadget that does away with your challenges of space and organization. 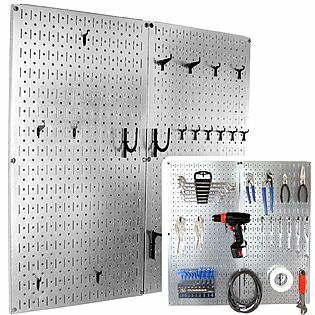 This 5-position wall organizer for tools features compact sizing and a clean design for use in kitchen, utility room, laundry, gardening or office use. 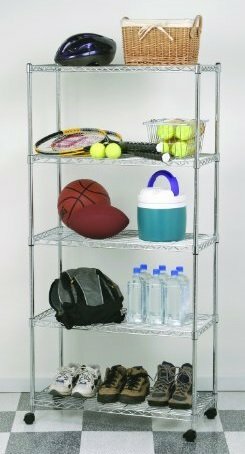 It is a wall organizer designed to hold various household objects with handles of varying thickness. Simply insert the handle into a slot and a rounded, gravity controlled, rolling ball automatically adjusts to the handle's thickness and grips it securely. This wall Organizer securely holds household items with handles neatly in place with an easy release by lifting the handle. This storage systems ball can hold up to 7-1/2 pounds of weight and installs easily and really works well holding both thick and thin-handled cleaning tools. Users like this design in that the holders are not the ones that you have to press and click or pull hard to get broom off. The balls just engage on the broom and when you want to take it off just lift slightly and store or release your products. Some reviews have pointed out that anything heavier than a standard broom, or brooms with steel handles that have less friction than ordinary plastic/wooden sticks are not gripped securely enough and will gradually slide downwards. Overall, the Evriholder works quite well with an incredibly practical design that can store multiple sized tools. 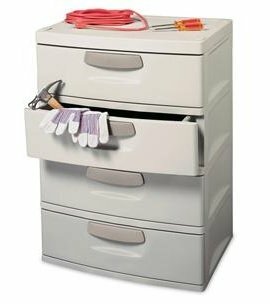 It is a very cost effective organizational tool that provides the convenience of having the objects stored neatly and out of the way. So I got my broom and put the handle in the holder. Provided you only have little cleaning items, brooms, tiny swiffer mops, small dust pans, I guess this'd work. For anyone with a fair number of different sized cleaning brooms or mops, this item becomes cumbersome given its short width. It was a little bit tricky at first, but very nice for the money. 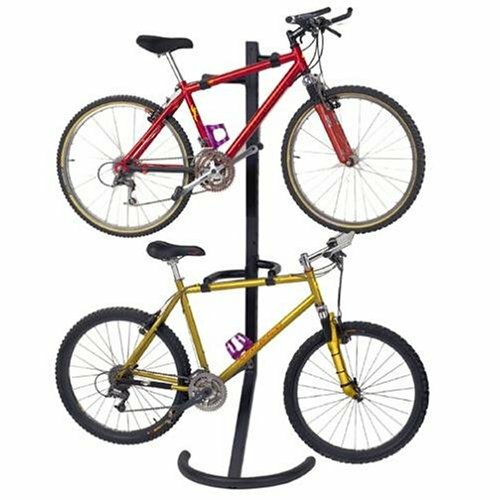 I was looking for a tool rack and ran across this one while surfing Amazon. This little corner was disgusting, despite the irony that the items stored there were for cleaning such messes. 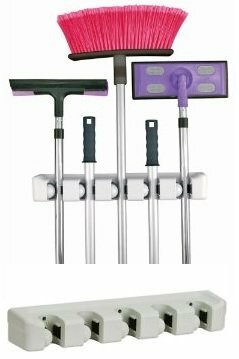 Before I bought these; my broom, swiffer, and other miscellaneous floor cleaning necessities, laid messily against the wall next to my dryer. I've found that there are better options located at your nearest home improvement store. WORKS GREAT AND HOLDS HEAVY ITEM'S, TOO. It's holding items on each slot without a single problem. 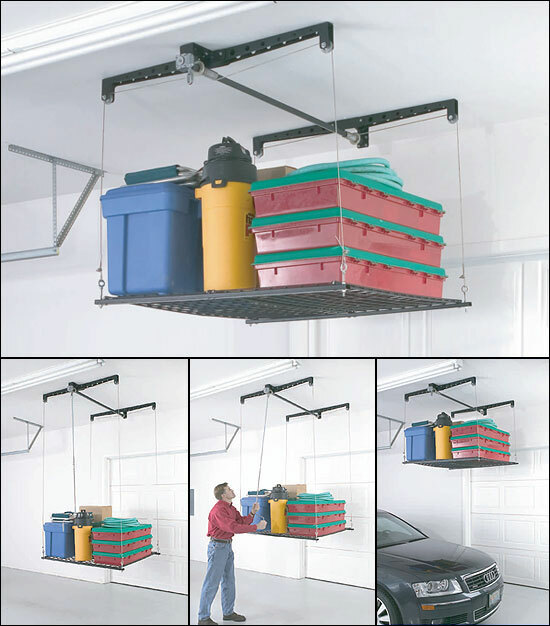 Smooth and easy to hang and remove items. This item is a little sturdier and better quality then a similar item sold at various department stores, but unlike the cheaper item, this one doesn't have little hooks and towel holders. Holds items firmly in place and does exactly as described. Items are held in place by a roller ball, which has rubber rings on it to create friction and hold any item in place. Items hung from unit: Broom/pan combo and Swiffer wet jet. Great item, it's performing better than expected after reading other reviews. It'll only hold pole type cleaning items, no dust pans or small brushes. Meaning - if you hang an item that's a wide base (say a broom), it'll take up more horizontal space and thus it'll be difficult to hang items directly next to it, because the items will be crowded at the base. keeps all my brooms and swiffers and whatnots out of the way. It really allows more floor space and cleans up mess of falling over brooms, etc. 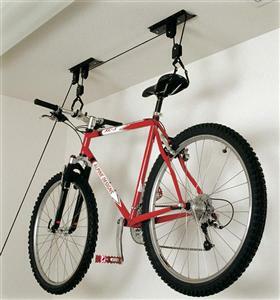 I put this in my broom closet and now am ordering another one for my garage. It installed easily and held most of our tools, brooms, mops, and such. These holders have been very helpful in organizing our garage, allowing us to hang brooms, mops, shovels, rakes and paddles on the wall and out of the way. What really disappointed me was that very quickly; some of the springs/rubber bands/balls broke and no longer held any broom, etc. It held all of my brooms and 2 of my mops. Only thing that could use some re-engineering would be that the holders are a little too close together so you need to alternate hanging one device broom up and next broom/sweeper down and so on. this's just the go to tidy up that broom cupboard and get things organised. This product was designed to grip the handles of brooms and mops, etc., but it doesn't. Handled items go between the balls that hold them in place easily, and come out easily. Which has a way smaller handle than the brooms or mops do! Some handles may be too thin to hold well. My mom had been looking for a convenient place to put her broom and other things with a handle that required no muscle power. I can't believe that every handle of my brooms and mops are so oddly sized that they don't fit this 'universal' holder. Sure enough, it happened to me. One of the balls is stuck open so that a broom handle can't be hung in that spot. I'd seen a review that warned that the balls that hold each handle in place can get stuck. I'd to remove the bulky handle grip from that to make it come in and out easily. Keep your brooms and mops at easy access. Easy install, works great, and now I've an organized supply of mops. This really keeps my mops and broom organized. This item is nice looking and easy to install. This was very easy to install Now everything is off the floor and in easy reach. It holds brooms and mops in place. The product does it's job but it isn't easy to install. I've a broom, mop, swiffer, and dirt devil steam mop ! everything is in place, perfect!.